Gentrification and the Hipster Breakfast; illustration for latest Square Meal magazine. Illustration to accompany an item on restaurants and cafés as an instrument of gentrification, for Square Meal magazine. 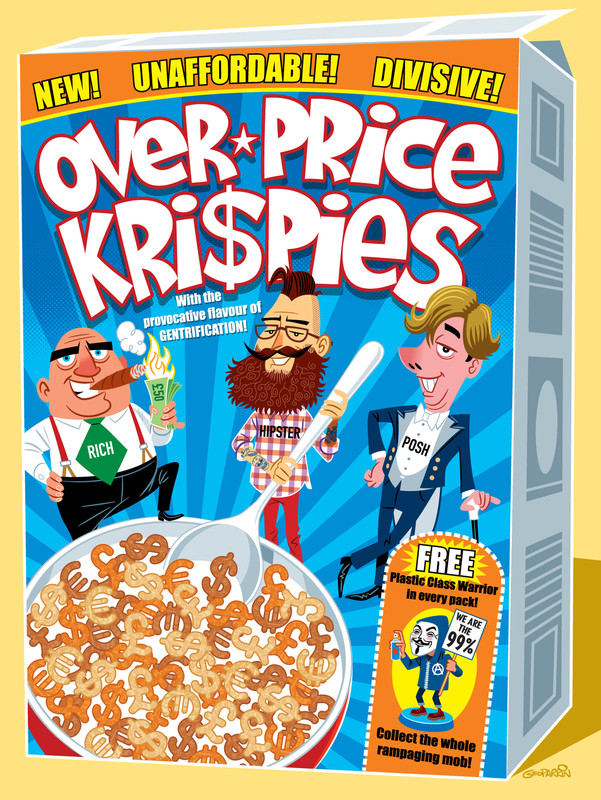 The image is inspired by the recent, high-profile case of Shoreditch breakfast joint Cereal Killer being targeted by Class War demonstrators, which is referred to in the article. Great fun doing this one, and creating alternative versions of Snap, Crackle and Pop. It occupies a full page of the magazine and, at first glance, could easily be mistaken for an ad. Although emphatically NOT the sort of ad normally featured in Square Meal – far too downmarket! ← Two more Chilli Pickle labels!